Last week we learnt about the skills needed to successfully navigate a ship, both in 1836 and today. This week more navigational references are made in Hutchinson’s journal. How would these skills have been acquired and what education would have been required in 1836 to navigate a ship successfully across the globe? There were a number of children onboard the Buffalo, travelling to South Australia. Had these children been going to school back in England? What sorts of skills would they have brought with them and what skills what they been taught during the journey? Stevenson in his journal makes a number of references to children, expressing his concern about their lack of education during the journey. How important was schooling in 1836 and what knowledge, skills and understandings did children need for life in the new colony? What was the English education system like in 1836? How have the skills and understandings required for adulthood changed between 1836 and today? What types of schools existed in England in 1836 and who controlled them? How did the education of boys and girls differ in 1836? Schooling was not compulsory in 1836 and it was not until 1870 that the British government introduced the Forster's Education Act (also known as theElementary Education Act 1870) , the first piece of legislation that looked at education across the whole of Britain. In 1880, another act was passed, making it compulsory for all children to attend school between the ages of 5 and 10, and by 1918, the school leaving age was raised from 12 to 14 years old. What causes these types of changes to occur in education systems? How did the education of the higher classes of society differ from that of the working class in 1836? 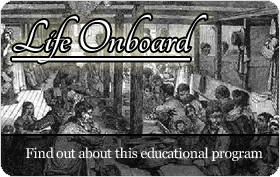 On ships, passengers were segregated into different classes. Do different classes of society exist today? 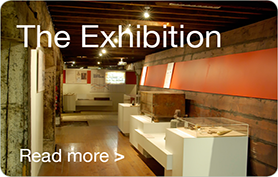 Research the types of resources used by students and teachers in South Australia since 1836. Create a timeline to show the significant changes that have occurred in classroom resources (eg. slate, paper, blackboard, whiteboard, interactive whiteboard, computers, etc). Libraries have long been a place for research and learning. The Tam O’Shanter carried a trunk of 117 books onboard. These were to become the first books of South Australia’s public library system. How do you think these books were selected and what do you think these books were about? In 1834, a Poor Law was introduced in England. How did this law impact on the education of children in poor families? Use the attached link to learn about this law and discuss the attached questions with others in your class. What do you think would happen if the government wanted to introduce the same law today? Explore the following websites: Victorian Schools Children at School Select one of the images that interest you. Ask students to identify the conclusions that can be drawn by looking at the drawing. Invite students to add speech bubbles or a caption to their photograph. Give students a digital camera and ask them to take a photograph of a person, place or object that best represents their chosen image today. Repeat the process of adding speech bubbles or a caption. Display images side by side to draw direct comparisons. Why was the education of girls different to that of boys in 19thcentuary England? Research Dorothea Beale and Frances Buss who were pioneers in ensuring girls received a good education. Why were there different challenges for girls and why was it harder for girls to enter careers such as medicine and law? Ask students to share slogans they might know, (Eg. Don’t dream it, do it). Discuss the reasons we use slogans and examine their structure. Ask children to develop their own slogans to motivate and create a positive classroom environment. Invite students to develop a poster displaying their slogan, with an accompanying image. What do you consider to be the most important fact, understanding or skill that all children in the 21st century must have? Develop your own lesson plan to teach this to the rest of your class. Be sure to include a list of resources you will need to teach your lesson. Research what a child’s life would have been like in England in 1836. Write a journal outlining your daily routines, both at home and at school. Include an outline of the lessons you may have had during the day. Draw comparisons to your daily routines and school timetable today. Develop a profile of a child living in 1836. Present your work as a one page biography, showing information such as what would they have looked like, their interests, family, pastimes, etc. How important was it for children in 1836 to have an understanding of the British Empire? Use a world map and colour the countries that were under British rule in 1836. Use another map to show the Commonwealth countries of today. What changes have occurred and what caused these? With limited resources, the children onboard would have spent a lot of time talking. Verbal communication skills have always been important, but today it is also necessary to have well developed written communication skills. From the journal entries in this blog we can see that the literacy skills of each writer varied greatly. Nowadays with the use of email, SMS and handwritten letters, it is important to have a range of written communication skills. When we communicate in each of these forms, we use a different written structure and language forms. Write a letter, email or SMS to your teacher asking for an extension for an assignment. How would your use of language change using each of these forms of written communication? Examine a variety of writing instruments, including ink blocks, quill pens, slate slabs, small blackboards, chalk, pencils, computers, typewriters, etc. Ask students to order these items from the earliest forms of writing to modern day techniques. Invite students to use writing instruments that they may have never used before. Learn about students and schooling in another country by connecting with a class from another part of the world. Be sure to negotiate the rules and expectations of this experience prior to sending any items abroad. Send a small native animal toy to your ‘buddy class' and ask that they send you one from their country. The visiting animal is given a travel diary, which is regularly taken home by students. It is each student’s responsibility to maintain this travel diary, when they have the animal. The diary might include photographs and written entries outlining the animal’s adventures. After 6 months, or an agreed length of time, the visiting animal is sent back to its original class with the completed journal. You should also receive your native animal back with a journal containing information about its adventures abroad. Children were required to attend school between 9am and 3:30pm each weekday prior to departing England and attend daily lessons during their journeys. Would they be better equipped to start life in the new colony, South Australia? Give reasons for your decision. It was not necessary for children to have a formal education in 1836 because all the skills and understandings they needed were developed through real life experiences. Once you have finished school, you have all the skills and understandings needed for life. You never have to attend a school again. This week we have learnt about the importance of education and lifelong learning. It is compulsory today, in both England and South Australia for children to attend school up until the age of 16. Sometimes students can get up to mischief at school, but there are consequences for inappropriate behaviour and actions. These consequences differ and are determined by the severity of behaviour. Next week we will look at discipline onboard. We read about a problem onboard the Africane and discover the punishment given for inappropriate behaviour.